ENGLEWOOD — A group of Englewood teens is hoping a complicated contraption with a funny name can help decipher the secrets of good financial habits. To help promote the 12th Annual Money Smart Week, the Federal Reserve Bank of Chicago has teamed up with pre-engineering students at Lindblom Math & Science Academy High School for a financial literacy initiative. Helping consumers better manage their personal finances is what Money Smart Week, which is April 20-27, aims to do, said Alejo Torres, senior outreach manager for the Federal Reserve Bank of Chicago. So as a way of increasing financial awareness among teenagers Torres said the Fed challenged students to build a Rube Goldberg machine from ordinary materials, such as paper, hangers and tennis balls. And the Federal Reserve Bank donated $10 million of shredded bills for students to use, and upon completion the machine would end with a coin dropping in a piggy bank. The 100-foot-long machine is being assembled at the South Side school, and 18 students worked on assembling it during last week's Spring Break. The goal for students, said Bridget Kagan, a spokeswoman for the Federal Reserve Bank, is to show that while building the machine is challenging, it's easy to save money. The project, which is being built with the help of engineering mentors from the University of Illinois at Chicago, will be unveiled April 17 at the Fed's Downtown location, 233 S. LaSalle St.
Torres said as part of its Money Smart Kid contest the Fed will also award one $5,000 and two $2,500 scholarships to students in grades five through eight. Students had to explain the difference between an investment and an expense, and how might they invest in their community and why. And giving up their Spring Break to work on the project was not a problem for students either. "This is a good project because we are using random materials to do something good and that shows how creative we are as teenagers," said Walmer Saavedra, a 15-year-old freshman, who aspires to be a structural engineer. "Spring Break is a time to relax and have fun and I am doing both as I work on this project." Guadalupe Huerta volunteered for the project even though she deemed it difficult. "On one hand, I said it was a difficult task, but on the other hand, I said it sounds like a lot of fun," the 16-year-old junior said. "Then I thought, 'What a cool experience this would be for me.' So that's why I got involved and gave up my Spring Break." Corey Morrison has been a math teacher at Lindblom for two years and in that time he said interest in engineering has soared. "Believe it or not, this project forces them to use their math skills. It's not just about building something as much as it is about being creative while you think," Morrison said. "This is the biggest project these students have worked on." He said students made a paper roller coaster in December; last year students also built an 18-inch tall tower made out of paper towels. Looking long-term Alan Mathers, Lindblom principal, said he would like to secure funding to start math, science and technology after school and summer programs for Englewood youth. 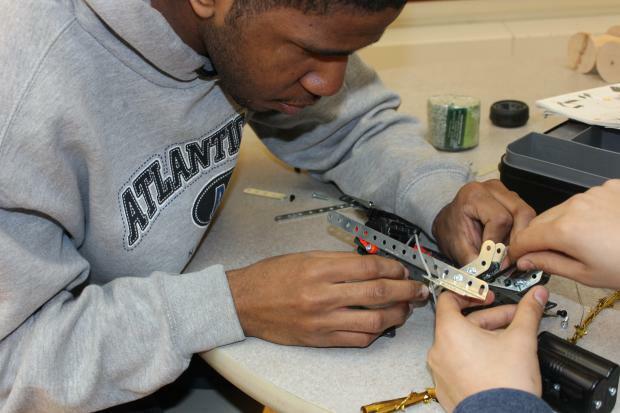 "As a resident of Englewood, Lindblom is always looking for ways to give back to the community and creating STEM (Science, Technology, Engineering and Math) programs is one one of giving back," Mathers said.